Try as we might, it (usually) isn’t possible to spend the whole day gaming. What’s a gamer to do in the hours we're not saving the world from certain destruction? If you haven’t jumped on the podcast train, this may be the time to start. Podcasts are great for staying in touch with the gaming world when in your morning commute, working out, doing chores...pretty much anything that allows you to listen while you work. These seven podcasts (listed in no particular order and with a quick summary) range from lively discussions about the most current happenings in the game industry to more academic discussions on the history of your favorite fandoms! Most of these have been around for a while, so there are lots for you to listen to, and a good chance they’ll be around for awhile if you get attached. The best part? They’re all free and we’ve got links for your convenience. Wizard and the Bruiser: Holden McNeely and Jake Young take you on hilarious, yet informative, weekly deep dives into your favorite nerd topics ranging from Sonic the Hedgehog and Overwatch to D&D and Dwayne “The Rock” Johnson. Get ready to beat your friends at all the nerd trivia nights. Giant Bombcast: A podcast for those in it for the long haul: these guys have been around for years, and their weekly 3-hour (!!) 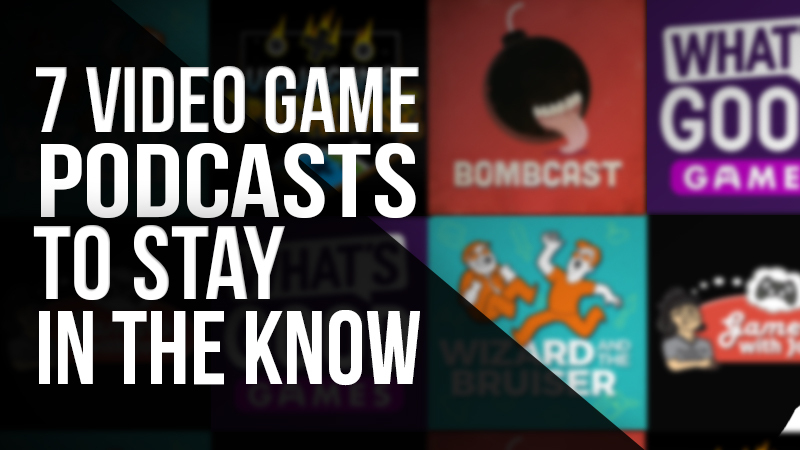 podcasts are long, but full of detailed info about the latest gaming news as well as plenty of wacky tangents. What’s Good Games: Relatively new, but taking the video game podcast world by storm, What’s Good Games is what you get when you take four friends with 30 years of combined experience in the industry and mix it with weekly industry news, lots of funny commentary, and hands-on experiences on the biggest titles coming to console and PC. Checkpoints: A unique take on exploring influences in the industry, each episode of Checkpoint focuses on someone who works in the game industry and the titles that have shaped their life. Psychology of Games: Get a bit more academic with Psychology of Games, a weekly podcast delving into fascinating topics like gaming as therapy, why people play jobs-based games, video game addiction, why we love to hate negative reviews, and more! Vidjagame Apocalypse: Not only do industry veterans Mikel Reparaz and Chris Antista talk new game releases and industry news in their show, each week they bring in another guest from the industry to provide unique perspectives and insights. Gamers with Jobs: Not only does this group of podcasters feel like an extended family: they’re all older gamers with families and jobs, and the podcast reflects their desire to talk in-depth about the latest games in a more grown-up way. Got other favorites? Any we haven’t listed? Let us know on Twitter or Facebook!